A bit out of the way, but worth the trip...if you have the time and make it a leisurely one. A perfectly-preserved medieval hill village of narrow, winding streets, stone-roofed houses, and the inevitable château at the highest point, St-Cirq-Lapopie offers a bonus...of a sort. The village is set in a beautiful valley through which winds the River Lot (map). To reach it, you must drive for quite awhile through forest and field, uphill and down, around curves and corners, through rock-hewn tunnels and across bridges. It's a beautiful drive, but to fully enjoy St-Cirq-Lapopie, you must allow plenty of time to do it and enjoy it, and not be in a rush, because it is not a fast drive. As for visiting St-Cirq-Lapopie itself, it's small, and it takes only an hour or two to walk most of its streets, take in the view from a pinnacle of rock, and perhaps stroll down to the river. But if you rush, you're missing the point. You've seen many other medieval villages and towns, you've wandered their streets and inspected their churches, houses and shops. 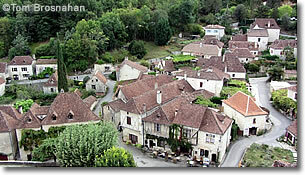 In St-Cirq-Lapopie, the secret is to de-intensify: make the day one of slower enjoyment and leisure. As always in France's medieval towns, parking is tortuous. In high summer, avoid the hassle of trying to find a place in the parking lots closest to the center, and opt instead for parking lots at the bottom of the hill, which will save you time and money at the end.